I’ve been feeling a little bit stretched in many different directions lately because we’re moving! I’ll share details about when, where and how soon – don’t want to jinx anything. So let’s just say I have lists of things to do today, tomorrow, within a week and within a month all over the place, boxes are starting to pile up in each room, random people are stopping by my house to buy my junk treasures, and I’m trying to work and create a recipe or two for you in between it all. So these are my favorite three words these days. No. Cook. Dinner. No, maybe five favorite words: No Cook Dinner With Leftovers! Whether you’re packing and moving, or just really busy and it’s too hot to cook, you’ll love this easy recipe that feeds a crowd, or your family for at least 2 meals. Or it can feed just you for a few meals and lunches. Feel free to adapt the ingredients to whatever vegetables or grains you have on hand. It keeps beautifully for 3-4 days in the fridge! 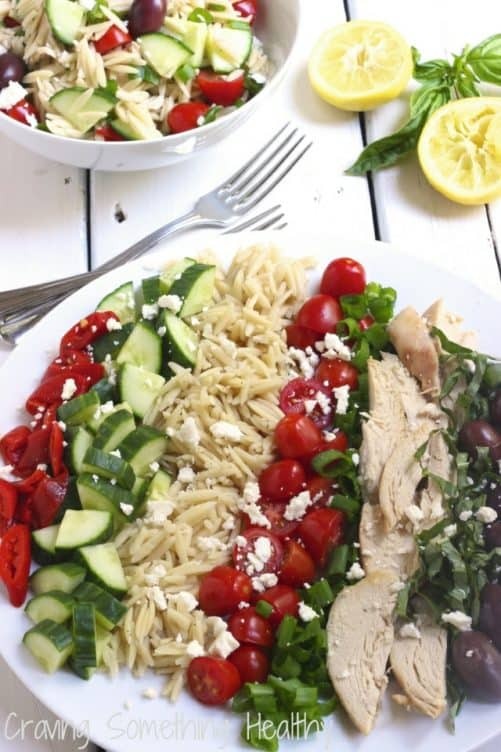 If you can find whole wheat orzo, use it here for more fiber and a lower glycemic index. Otherwise, feel free to use farro instead of the orzo. I used a rotisserie chicken breast, but of course you can grill or roast your own chicken, or leave it out and keep if vegetarian. Mix all ingredients for the dressing in a measuring cup and set aside. 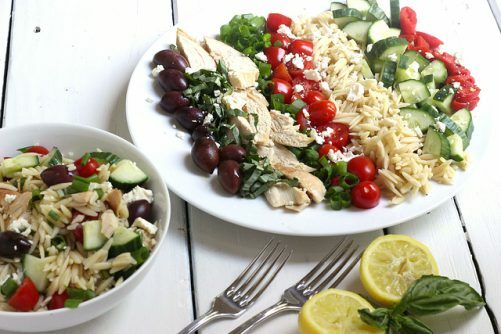 Place all salad ingredients except for feta cheese in a large mixing bowl. Toss well to combine. Pour salad dressing over all, stir well and refrigerate for at least an hour to let flavors blend. Sprinkle feta cheese over just before serving. Keep leftovers tightly covered for up to four days. Feel free to add more or less of any of the vegetables. Refrigerate leftovers for up to 4 days. Do you have any favorite no cook meals? Does anyone have any tips for doing a BIG move with a cat? Thanks Jessica! I think pretty salads always taste better! Thanks for the encouragement! I’m trying to do a box or two each day! I love love orzo so why do I rarely cook it? This looks delish 🙂 Exciting news about your move! This looks so delicious and exactly the way I like to eat! I’m headed to the grocery store today and will pick up everything I need to make this dish. Thank you! Thanks so much Susan! I hope you enjoy it 🙂 Thanks for visiting! Popping over from Over 40 Bloggers on FB and what a yummy salad. 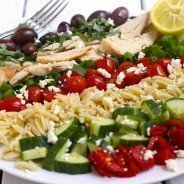 I love greek salads and this is a creative way to serve one. I will be trying this. I can’t get enough Greek food in my house, and fortunately my kids and hubby like it too. Your salad is definitely calling my name!! I think it would be perfect w/ cooked whole grain sorghum for a gluten-free version. Yum!!! P.S. Good luck with your move!! !